§ If you planted them last fall, they should be good to go. If they have been in place for a while, sprinkle a ring of about ¼ C. of bone meal around each set of shoots as soon as they appear and carefully scratch in with a hand cultivator, then water in. § If leaves emerge, but you don't get flowers, they aren't planted deeply enough. Wait 'til the leaves fade, then cut them off and add 3-4 more inches of compost on top. § If no leaves emerge, suspect that critters dug up and ate the bulbs. Replant new bulbs next fall, and put lightweight chicken wire over the ground to foil the critters. § If you cut flowers, leave the leaves. They will make "food" for next year's flowers. § As the leaves fade, you can "braid" them, fold them in thirds, and rubber-band them in a clump so that they aren't so visible in the garden. § Let the leaves turn brown and then cut them off at the ground and discard. § If you pull leaves out before they're dead, you may disrupt the bulb down below. § If it bothers you to have the dying leaves in your garden, interplant annuals and as they start to bloom and take center stage, the dying bulb leaves won't seem as unsightly. § Use only light mulch in areas where you have spring bulbs, as they need the warmth from the sun to bloom in early spring. You can always move mulch aside for them, and once the leaves are about 6" tall, put the mulch back. § Sprinkle a ring of about ¼ C. of bone meal around each set of shoots as soon as they appear and carefully scratch in with a hand cultivator, then water in. § Iris can be divided any time. They probably need it every three years. It's easiest when the shoots are just a few inches tall. On a dry day, dig up the clumps and break them apart with your hands. You will see the "corms," which are ugly - like flat potatoes. Throw away the central ones. Then replant each corm a hand-span apart, with the roots going downward in loose compost, and the top half or third of each corm showing. The sun needs to reach the top part of each corm to give the energy for the bloom. Firm the compost around the corms, and water in. § Water iris twice a week 'til it blooms, if it doesn't rain much; it needs lots of water and good drainage. § Cut off spent flowers; never pull dead stalks. 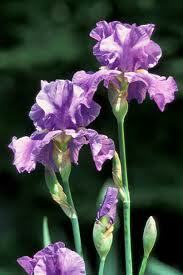 § Iris will bloom best in full sun but will do OK in partial shade. § In October or November, take a sturdy pair of scissors and cut each iris clump into a fan shape about six inches tall. Cut up the left side, across the middle, and down the right side. Discard the leaves. Next spring, when the new shoots appear, you can cut off the remaining six inches of last year's leaves. They are there to protect the corms over the winter. § Iris crowds together well and probably doesn't need mulch. § Sprinkle a ring of about ½ C. of bone meal around each cluster of shoots (they will be red or burgundy) as soon as they appear and carefully scratch in with a hand cultivator, then water in. § If they have been in place for many years, you might consider putting a tomato cage around the shoots when they are still a foot tall or so, so that the branches don't droop to the ground once they are heavy with blossoms. 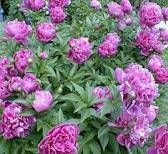 § Peonies like moist soil, but water the soil, not over the top, to avoid leaf disease. § When the buds appear, pinch off the side buds with your thumb and forefinger, leaving just one central bud per shoot. Then you will get bigger blossoms! § Ants crawling around on peonies are good. They help open the blossoms. Peony buds are very sweet. If you bring a bouquet in the house, shake off the ants first! § Cut off spent blossoms before the petals spill all over the ground. Cut each shoot about one-third off; this will put more energy back into the roots for next year. § In October or November, cut away and discard all peony shoots so that bugs and disease don't appear. § Almost all diseases on peonies are because of overcrowding. If you see black spots on leaves, it's fungus due to poor air circulation. 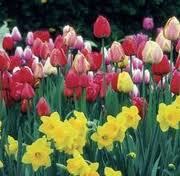 Dig and divide, replanting at the same depth you dug them up, and keep watered frequently for the first month. 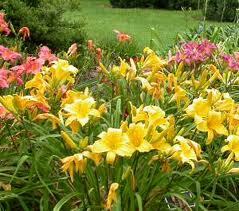 § It's a good idea to mulch around day lilies to keep weeds down, although once they really take off, after a couple of years, they will self-mulch with their many leaves. § Let the flower stalks die to dry brown, as the green replenishes the roots; you should be able to gently pull them out - if you have to tug, they aren't ready to come out. § In October or November, clump the remaining leaves, and give them a butch haircut, straight across, about six inches off the ground. Discard leaves. That's it! 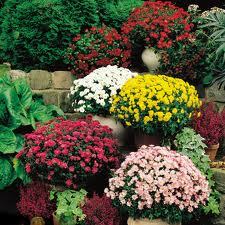 § Mums tend to get too crowded, so when they are 3-4 inches tall, you might dig up the whole clump, throw away or transplant about two-thirds of the little starts, and replant just one clump with some good compost. Firm in and water well. § On the first of June, July and August, pinch away about one-third of the height of each shoot in the mum clump with your thumb and forefinger. If you don't do this, the plant will get too tall and spindly, and when the flower opens, it will droop to the ground. § If you see buds developing before Sept. 1, pinch them away. § If you want color in October, pinch just the top set of leaves on Sept. 1. Otherwise, look for your best color around the second half of September. § You can either cut off dead mums to the ground once the blossoms are spent, or just leave them in the garden 'til spring for a little texture.